5/1/14: University of Vermont's Pi Kappa Alpha fraternity got a treat Thursday at Merrill's Roxy Cinemas in Burlington. They attended a special screening of Universal's upcoming comedy Neighbors followed by a Q&A with star Seth Rogen and his wife, Lauren Miller. 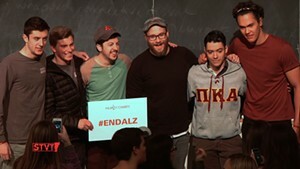 Pi Kappa Alpha won its meet-and-greet with the movie star by raising more than $27,000 for Alzheimer's research in a campus contest run by Rogen and Miller's organization Hilarity for Charity. 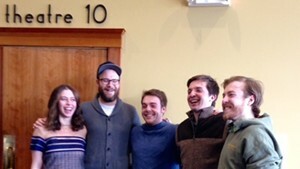 The contest raised over $128,000 and Neighbors opens May 9th. Music: Pretty & Nice, Pink & Blue, "Busy Bees"